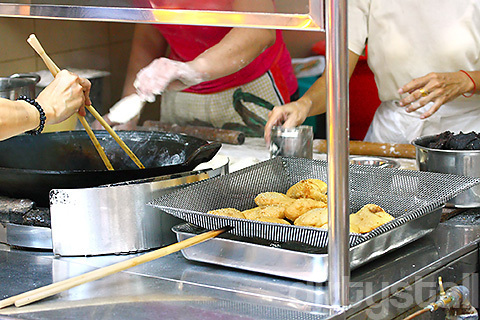 Maxwell Food Centre is one of Singapore’s favourite hawker centres, conveniently located in the heart of the business district and also home to many great hawker stalls, including the famous Tian Tian Chicken Rice. 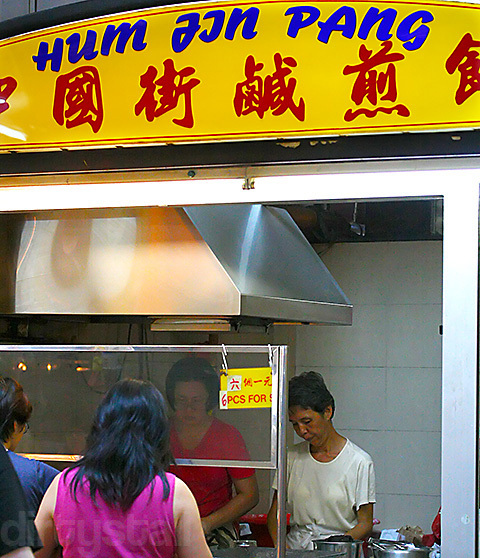 However there is another famous stall that draws long queues – this good old hum jin pang stall. It is really a bargain, getting 6 yummy pieces for just $1. Many customers usually walk away with several bags to share with their friends or family. I first ate at this stall about a decade ago, back then it was an old man and his daughter, working tirelessly to knead and roll the dough. Now I don’t see the old man anymore, perhaps he is just too old for this work already. But his daughter is still here to take over the legacy, together with her mother I presume. They still do it like clockwork – cutting, kneading and folding with precision honed over the years. 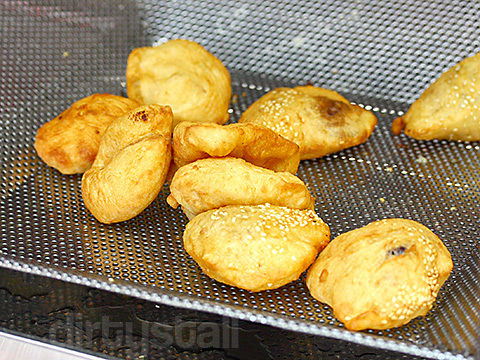 There are 2 types of hum jin pang available, the salty five-spice ones and the sweet red bean paste ones (indicated by sesame seeds). My favourite type is of course the salty ones! 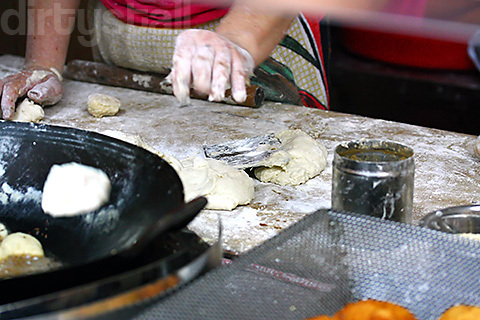 After they fling it in, you have to keep prodding and turning the pieces of dough with a giant pair of chopsticks. Sometimes you will end up helping the person before you to cook their pieces. This is fairly common as eventually the person behind you also will take over to cook yours. The heat can actually be intense for first-timers doing this but the reward is worth the suffering. 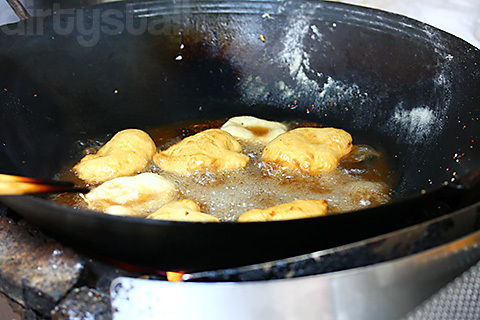 Eventually the dough bloats up like a balloon and once it browned golden enough, you can take it out and put on a tray to drain off the excess oil. Look at those yummy little morsels! After buying them, I walk away and stuff my face, chomping and gobbling them down like there’s no tomorrow. My advice is to buy more bags than you think is enough, because these things go down fast and they are not as filling as they look. 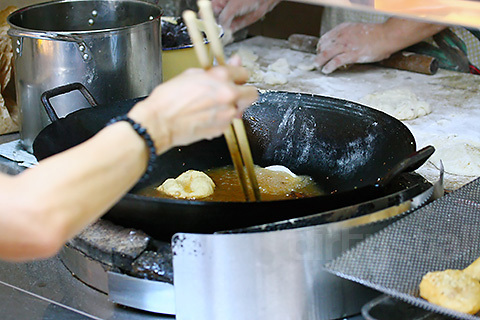 8 Responses to "Hum Jin Pang at Maxwell Food Centre"
Yes, this store is really good. The red bean one is nice too with the sugar coating. And like you say, one bag is never enough. Yeah I always order 2 bags minimum! No leh they never really appealed to me. Are they very yummy too?